Shoofly pie with pecans and a poached apple garnish, inspired by The Metamorphosis by Franz Kafka. It’s really hard to sell people on this pie. The particular, bitter tang of molasses cut with woody pecans, balanced with the sweet, syrupy taste of an apple poached soft in cider, cinnamon, and brown sugar; it all takes a backseat to the creepy-crawly stigma of Kafka’s disturbing novella. It is, however, an excellent pie for Autumn! Gregor Samsa, a traveling salesman working to pay off his parents’ debt to his boss, wakes up one morning to find himself “transformed” into a giant, hard-backed, spindly-legged, grotesque bug. “Vermin” is (the translation of) the word Kafka uses. His parents and his sister find the family home infested by Gregor’s monstrous presence, their sanity slipping and their relationships deteriorating as the creature before them seems less and less like the son/brother they know and love and more as an emotional and physical burden. Kafka was one of those writers who worked a variety of day jobs to bring home the bacon while he pursued his true passion. Most notable among those was a job in insurance, where he reviewed injury claims (and the gristly photos that often accompanied them) from industrial accidents, affixing value to lives and limbs. Like Gregor, Kafka was a working man, someone for whom work was a necessary evil, and that seems to find its way into the tone of The Metamorphosis. When I initially read this novella back in high school, it struck me how easily Gregor’s family turned on him. Rereading it now I was struck by how, although his mentality adjusts to his predicament, Gregor seems surprisingly optimistic. Once he no longer needs to worry about his job, he seems unburdened. Of course, new sources of trials, trauma, and anxiety inevitably fill the void. It displays the confusing, complex mix of emotions of a family under duress through a lens of the impossible. If not to parse and process it, then at the very least to validate that struggle through observation and depiction; to bear witness to both the weight and effervescence of life. The symbolism in this pie is simple: think bugs. The base is a shoofly pie, partially for the name and partially for the brown, molasses-like ichor that Gregor bleeds in his vermin form. Pecans? Pecan pies have that distinctly mottled look to them. And, well, the nuts themselves kind of look like bugs. …And they’re crunchy like bugs. Sorry, I couldn’t resist. In the text, after the sight of Gregor causes his mother to faint, his father pelts him with apples to drive him back into his bedroom. One of those apples becomes lodged in Gregor’s back, which is where the idea for the cider-poached apple came from; I wanted to recreate the look of that apple caved into the surface of Gregor’s exoskeleton. In the end it turned out to be a great decision because the molasses and pecans are both very strong, heavy flavors and the apple does a nice job of undercutting that with a bit of something lighter and sweeter. This crust recipe is a half-portion of the crust I normally use. Per usual, combine flour, butter, water, and vinegar in a bowl and mix with hands or pastry cutter until dough adheres and comes together. Flour your work surface and pin and roll the dough out. Line your pie tin, roll and crimp the edges. Use a food processor to make the topping for the pie, pulsing the flour, butter, and light brown sugar together until combined. In a mixing bowl, whisk the baking soda and boiling water together until fully combined, then add the molasses and egg and whisk. The molasses is going to do a weird thing, don’t panic (I don’t know how to describe it, but you’ll see). Add the pecans to the molasses mixture and combine until evenly distributed. Pour the filling into the crust, top with the crumb mixture, and bake for about 50 minutes until the topping looks golden brown. Peel the top half of the apples, leaving the skin on the bottom, and rub the exposed part of the apple with a lemon wedge to keep it from browning. In a large sauce pot, combine cider, sugar, cinnamon, and nutmeg. Add the apples to the mixture (I did mine one at a time in a smaller pot so they were more completely covered by the cider, but you can do them all together as well), cover the pot with a lid, and bring them to boil. Watch them closely, it will take them about 30 minutes to become soft and sweet, but if you’re not careful they will split open and fall apart! For the initial effect of the apple stuck in Gregor’s back, cut one of the poached apples in half and rest it atop the fully cooled pie. However, these cider poached apples are pretty tasty and one will definitely not be enough for the proper pie-to-apple-garnish ratio! It definitely helps to have extras. 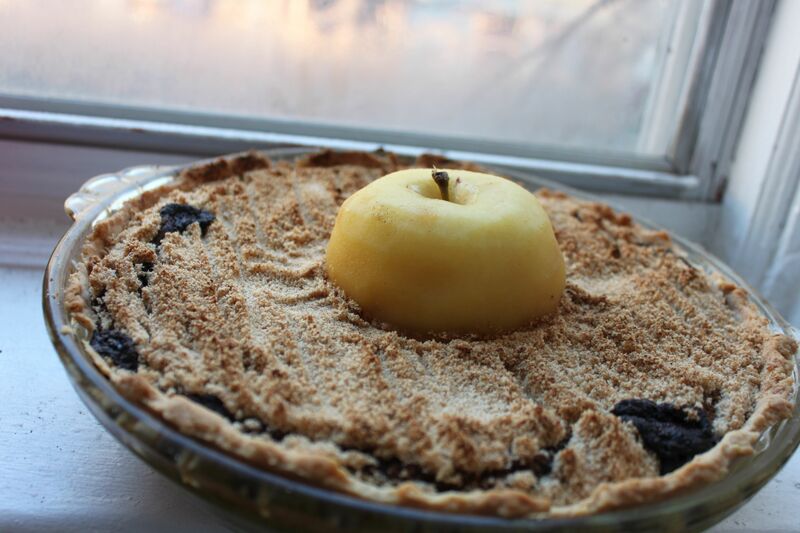 Smother your slice of pie in hot, sugary apples, drizzle with a bit of leftover cider, and consume while sitting at your window watching the world go by (preferably in the dead of night so no one can see what a hideous creature you’ve become).